Editing and publishing conference proceedings often takes such a long time that the publication itself is already outdated when it is finally accessible to its audience. By contrast, the newly published ebook “Proveniezforschung zu ethnografischen Sammlungen der Kolonialzeit. Positionen in der aktuellen Debatte” is a laudable counterexample in this regard. Published in April 2018, the book is composed of the contributions to a conference with the same name that took place a year ago, on the 7th and 8th April 2017 at the Museum Fünf Kontinente in Munich. 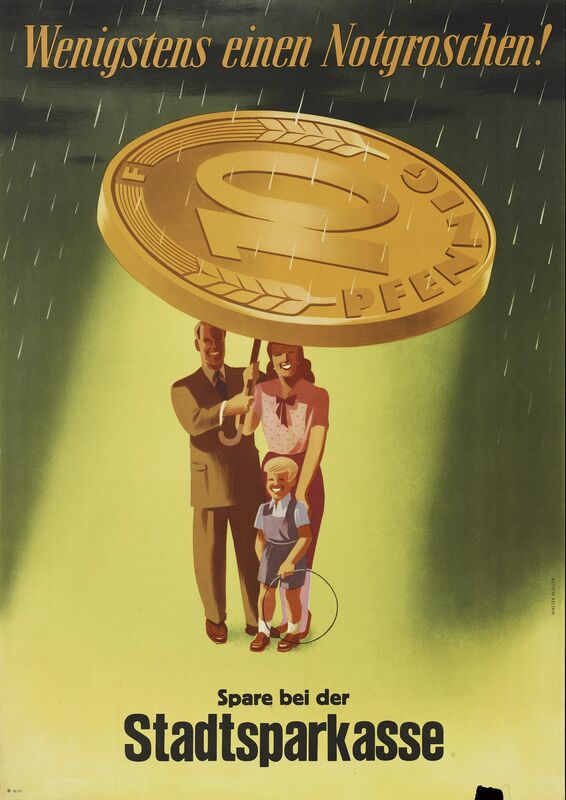 As of May 2018, the publication seems to be more relevant and up to date than ever. The 2017 “long summer of provenance research” enabled overdue and controversial debates and fuelled a critique of postcolonial activist groups about the way museums addressed the provenance of collections deeply embedded in their colonial contexts. Simultaneously, it heralded the start of an eventful year which indicated that the subject of the book has gained interest way beyond research agendas of ethnographic museums or small circles of cultural journalism but is now at the heart of controversial and cultural politics. Bénédicte Savoy resigned from the international team of experts of the Humboldt Forum, Emmanuel Macron promised to restitute cultural objects form French museums to Africa in Ouagadougou, and the new German government declared provenance research one of the main priorities in cultural politics for the years to come. Mindful of these recent events, the four editors Larissa Förster, Iris Edenheiser, Sarah Fründt, and Heike Hartmann invited scholars with backgrounds in social science and history, as well as a museum practitioner, to put their personal reflections on the publication up for debate in the Auditorium of the Grimm-Library of the Humboldt-University on 11 April 2018. Organised as a cooperation between the Centre for Anthropological Research on Museums and Heritage (CARMAH) at the Humboldt University and the “AG Museum der Deutschen Gesellschaft für Sozial- und Kulturanthropologie”, the evening succeeded in not just being a well-deserved celebration of the publication itself but also by simultaneously providing a platform for discussions on interdisciplinary approaches and the state of the art of postcolonial provenance research. In her introduction Larissa Förster (post-doctoral researcher at CARMAH) explained why the editors chose the expression “postcolonial provenance research”. She argued that it should not be used as a synonym for object biographies or the classical analysis of the histories of collections. Rather, she emphasized that provenance research – if it seeks to fully addressdiverse expectations it is facing – had to be re-invented and should move beyond mainly “occasion-related” research. She highlighted that systematic research informed by colonial history and its history of violence needed to find its way into German museums. Furthermore, Förster emphasized the necessity for new ways of cooperation, networking and the potential of linking postcolonial provenance research to the already well-established provenance research on Nazi stolen art. Editor Sarah Fründt (PhD researcher at the University of Freiburg) – also speaking on behalf of the editor Iris Edenheiser (curator at the Museum Europäischer Kulturen, Berlin) – similarly pointed out the need for new aspirations in provenance research. Fründt highlighted the importance of access to archival material for external researchers and other stakeholders to pursue provenance research. Subsequently, Fründt recalled Iris Edenheiser’s critique that ten years ago provenance research had still focused solely on exploring lives and collections of the so called “collector-personalities”. This was a reminder that the need for a re-narration of collections from colonial contexts had already been pressing for a long time and as of 2018, it is becoming ever more pressing. 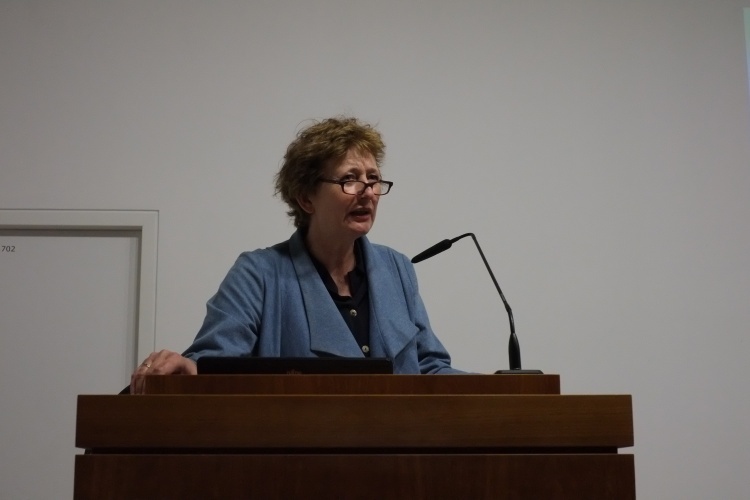 The fourth editor, Heike Hartmann (curator of the exhibition on the German colonial past, Deutsches Historisches Museum) bridged the conceptional gap between postcolonial provenance research and the politics of the remembrance of colonialism, emphasizing the importance of transcending the memory of Germany’s colonial past into its public culture. Recapitulating the recent developments in the political discourse, Hartmann also gave a cursory overview of the public debates on provenance research and restitution. She concluded by highlighting that ethnographic collections had become a tool for soft diplomacy. The talks of the four editors revealed shared consensus on the urgency to push for a transformation of the ways in which museums and researchers conceptualize and research the provenance of ethnographic collections from colonial contexts. This conviction was also shared by the three guests from Hamburg, Basel, and Göttingen. 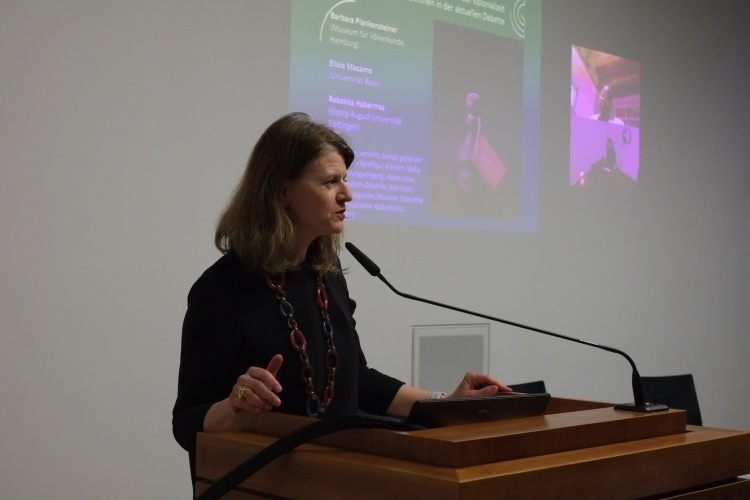 Barbara Plankensteiner, director at the Museum für Völkerkunde, Hamburg – the first guest speaker – offered insights into the everyday work of a museum director and daily struggles to pursue postcolonial provenance research within an ethnological museum. Plankensteiner, who is leading the repositioning process of the Museum für Völkerkunde in Hamburg, understands provenance research as a moral obligation and emphasized that it should not be used as a strategy for delaying controversial issues to the effect that missing provenance research would be used as an excuse to perpetuate the status quo. Further, she contextualized that ethnological museums – founded in the nineteenth century as archives – were strongly entangled in the colonial epistemology. 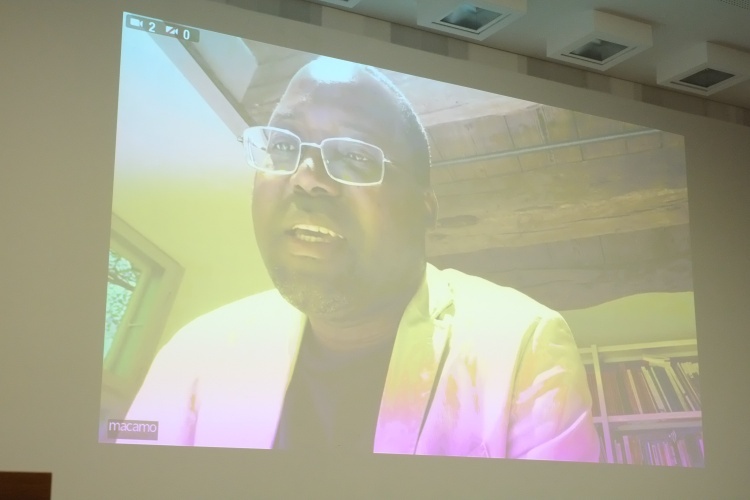 The second intervention came from Elisio Macamo, Professor of Sociology at the University of Basel, who joined the book launch via skype. He opened his statement by referring to a university class about sociology and the Global South. Macamo highlighted that the centerpiece of the class is to rethink social science and the humanities in general by asking, among other questions, whether science is the process of describing the existing world or, on the contrary, of creating the world through human perception. Allegorically, he referred to Daniel Kehlmann’s bestseller “Die Vermessung der Welt”. In the book the literary figure of Alexander von Humboldt forced dogs and crocodiles together in a pond for a scientific experiment – the values of Enlightenment unfolding as brutal absurdity. Macamo pointed out that he was mainly interested in the theoretical, conceptual and methodological questions of the new approaches of postcolonial provenance research. He stressed that provenance research cannot and should not avoid the fundamental questions on knowledge production. Emphasizing the need for interpreting Europe ‘from the outside’, he stressed that ethnographic objects had not only lost their original meaning but also gained new values, both in the Global North as well as in the Global South. Rebekka Habermas, Professor of History at the Georg-Albrecht-University of Göttingen, was the last speaker of the evening. She acknowledged provenance research as a vibrant field of studies and enquired what lessons historians might learn from it. She argued that entangling European history with material studies and colonial history as well as taking an active stand for the idea(l) of shared perspectives is valuable. Quoting Jeremy Silvester’s contribution to the volume, she pointed out that museums must move “from storage to storyline”. In the second part of her intervention, Habermas historicized the development of ethnographic museums by explaining the historical context of the nineteenth century from which such institutions emerged. During industrialization, colonialism, and nation-building, ethnographic museums could be understood as a culmination point of a Eurocentric focus of the European bourgeoisie and the frequent binary antagonism of us versus them. Ethnographic collections were not only linked to colonial epistemic systems, but also stood for a highly paternalistic gesture of preservation and functioned as machines for production identity for political elites. 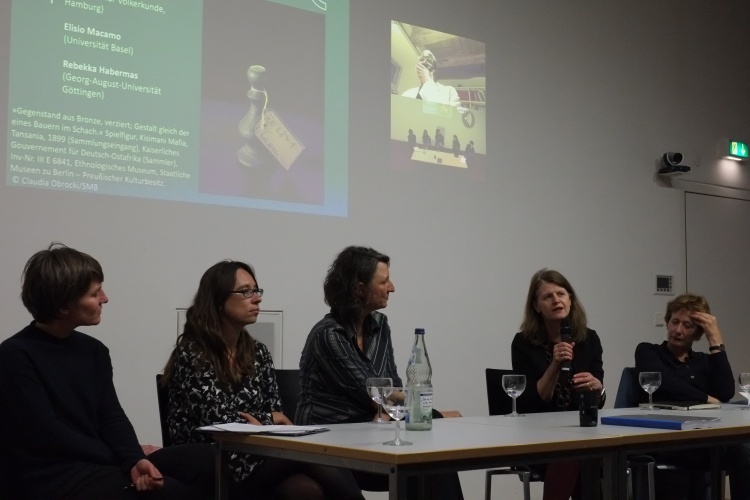 The evening concluded with an open discussion between editors and the guests, tipping upon the influence of postcolonial provenance research on other museum contexts, such as natural history museums. Bearing in mind the extraordinary inputs by the guest speakers, one might have wished for a group discussion. Regardless, the book launch (and later the reception) brought together activists, journalists, academics, museum professionals, diplomats, and cultural politicians. This showed that the dynamics of postcolonial provenance research are increasingly attracting interest not limited to specialized fields. Gabriel Schimmeroth received a Master’s degree from the Global History Program of the Humboldt University and the Free University Berlin. His regional focus is Sub-Saharan Africa. Currently, he works as a curatorial assistant (Volontär) at the Ethnologisches Museum, Staatliche Museen zu Berlin, with special focus on issues of provenance research.